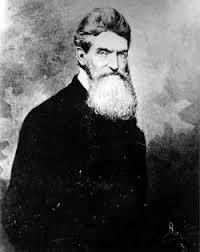 John Brown was born on May 9, 1800, in Torrington, Connecticut, he was the fourth of eight children of Ruth Mills and Owen Brown. In 1805, his family moved to Hudson, Ohio, his father would start a tannery business there. Brown, was raised an evangelical Christian. At the age of 16, Brown left the safety and comfort of his family home and moved to Plainsfield, Massachusetts, where he was enrolled in a preparatory program. Soon after, he transferred to Morris Academy in Litchfield, Connecticut. Brown had plans to become a congregationalist minister, but when he ran out of funds and suffered inflammation of the eye, he was forced to leave school and return home. Once back in Hudson, Ohio, he worked for a short time at his father’s tannery, before starting his own tannery business with his brother. In 1820, Brown married Dianthe Lusk, a little over a year later they would have their first child together. In 1825, Brown moved his family to New Richmond, Pennsylvania, he would buy two hundred acres of land there, build a home, a barn and a tannery. Within a year, Brown would create a post office, school and an interstate business that consisted of cattle raising and leather making. The years 1831 and 1832 were horrible years for Brown, he became very sick, one of his sons died and his wife Dianthe passed away. On June 14, 1833, Brown married Mary Ann Day, she was 16 years old. They would raise twenty children, seven of whom were from his previous marriage. In 1836 Brown would move his family to Franklin Mills, Ohio (now Kent). He would get loan to buy land and open a Tannery business. During the economic crisis of 1837-1839, Brown would suffer severely economically. Brown’s financially situation became so bad that he was put in jail, after refused to leave a farm he lost after not being able to pay the mortgage. In September 1842, Brown would be declared bankrupt by a federal court and a year later, Brown would suffer more hardship when he lost four of his children due to dysentery. In 1846, Brown and business parner Simon Perkins moved to the politically and socially progressive city of Springfield, Massachusetts. The city’s was a hotbed for the anti-slavery movement. From 1846-1850 Brown was a parishioner at the Free Chuch (now St. John’s Congregational Church), there he would listen to speeches from legendary abolitionists like Sojourner Truth and Frederick Douglas. In 1850, the United States passed the Fugitive Slave Act, a law that required authorities in free states aid in the capture and return of runaway slaves. In response, Brown founded the militant group called “The League of Gileadites”. In the bible, Mount Gilead was a place where the toughest and bravest Israelites would go to face an invading enemy. Before leaving Springfield, Massachusetts, Brown would give orders to the League of Gileadites to protect escaped slaves in the area. In 1855, Brown was informed by his sons, who resided in the Kansas territory that their families were at risk and unprepared for attack by pro-slavery forces, Brown would leave for the territory of Kansas with a son-in-law to collect funds and weapons. In 1856, Brown and the free settlers were hopeful that they would be able to bring Kansas in the union as a free state and as a result they were in direct conflict with pro-slavery activists, who wanted to make Kansas a slavery state. In May, the town of Lawerance was sacked by sheriff-led lynch-mob. The argument on rather Kansas should be a slave state or free state became so heated that pro-slavery Senator Preston Brooks brutally beat anti-slavery Senator Charles Sumner with a cane. 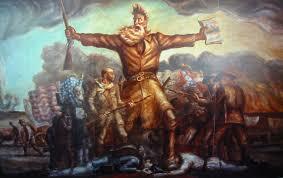 The incident threw gasoline on the already hot fire of John Brown and other anti-slavery activists. On June 2nd, Brown and 29 anti-slavery activists, nine of whom were his personal followers successfully defended Palmyra, a freestate settlement in Kansas against a pro-slavery missourian force, led by Captain Henry Pate. Pate and twenty-two of his men were taken prisoner and brought to Brown’s camp, where Pate was forced to sign a treaty in exchange for his freedom and the freedom of his men, Pate also had to agree to release two of Brown’s sons, who had been captured in an earlier conflict between the the Brown family and Pate and his followers. Brown released Pate to Colonel Edward Sumner, Brown would be infuriated when he discovered his sons release would be delayed until September. In August, Major General John Reid with over three hundred men from Missouri travelled to Kansas, with the plans to destroy the Free State settlement in Osawatomie and to march on the cities of Lawerance and Topeka, Kansas. On August 30, 1856, they attacked the Brown and his followers, killing son Federick and his neighbor David Garrison. Brown and his men who were numbered and outgunned seven to one, but still managed to kill at least twenty of Reid’s men and wound as many as forty. Eventually though, the numbers were just to high to overcome and Brown and his men were forced to flee across the Marais des Cygnes River, while fleeing four of Brown’s men were captured and one was killed. Reid and his Missourian force would pillage, purge, plunder and burn down the city of Osawatomie, while Brown and his remaining men were forced to hide in the woods for shelter. Both sides to disarm and disband. Brown would take advantage of the interference from the governor to devote time to raise funds and acquire weapons from his supporters in the north. In March 1858, while in New York meeting with supporters, Brown was introduced to Hugh Forbes, who was a mercenary from England, who had experience fighting with Giuseppe Garibaldi in Italy in 1848. After the meeting, Brown hired Forbes to be the drillmaster to his men and write a tactical handbook. Over the next few weeks, Brown and Forbes came out with a strategic and tactical plan to combat the system of slavery in the southern states, even though the two men had a difference of opinion on some of the plan’s details. In the month of November Brown and his troops left for Kansas, Forbes would not make the trip to Kansas, instead he would return to the East Coast because he had not been paid and his relationship with Brown continued to deteriorate, it got so bad at one point that Forbes threatened to expose Brown’s plan to the government. In January of 1858, Brown travelled to Rochester, New York, from his base in Springfield, Iowa, to visit with former slave and abolitionist, Frederick Douglas, the two men spoke about Brown’s plan and tl reassess some of Forbes’ criticisms. Brown also wrote provisional constitution, that planned be used when he created a new state in the region he was going to start his war against slavery. On May 10, Brown and his followers travelled to the small town Chatham, Ontario, Canada, to take part in constitutional convention. About one-third of the residents in Chatham, were former slaves. Brown would be elected commander-in-chief. Even though most of the delegates in attendance signed the constitution, only a meager amount signed to fight in Brown’s militia. To make matters worst, Forbes created major security issues when he attempted to expose the plans of Brown to Massachusetts Senator Henry Wilson and other politicians. In an attempt to make Forbes claims seem false, Brown returned to Kansas in June, he stayed there for six months. There he met with James Montgomery, a man who was already executing raids in Missouri. On the 20th of December, Brown performed his own raid with his followers and gave eleven slaves their freedom, he also captured two white men and looted supplies. On January 20, 1859, Brown made the long trip to to take the newly freed 11 slaves to Detroit, where he planned to take a ferry to Canada, while he was passing through Chicago, Brown met Allan Pinkerton, who assisted Brown with raising funds for the ferry ride to Canada. The next several months, Brown would travel to Connecticut,Ohio, New York and Massachusetts to gain more support for his revolution. On the 9th of May, Brown gave a lecture in Concord, Massachusetts, in the the crowd were several famous people, including Henry Thoreau and Bronson Alcott. In June, Brown visited his family one last time in North Elba, before be left for Harpers Ferry. As Brown continued to seek supporters for his revolution against slavers, he and his abolitionist allies were assisted by Harriet Tubman, whom he called the “General Tubman” .Tubman gave Brown and his allies access to her network and resources in border states like Delaware, Pennsylvania and Maryland, Tubman also assisted Brown with getting former slaves in Canada to fight in his militia. On July 3rd of 1859, Brown arrived at Harpers Ferry, several days later he used the name Isaac Smith to rent a farmhouse in Maryland to use as his base of operation. There Brown waited for his recruits to arrive, his plan called for 4,500 men, but only 21 men arrived to join by September. On October 16, 1859 , Brown and his men attacked the Harpers Ferry Armory, there plan was to attack the lightly guarded building and steal the over one hundred-thousand rifles and muskets. Once those weapons were acquired, plan-B, was to arm local slaves he and his men freed, then head down south to free and arm more slaves. Frederick Douglas and Brown’s family would later testify that Brown’s strategy was to continue to free and arm slaves in Virginia, eventually depleting Virginia of its slaves and then to moving on to other slaves states to do the same and make the system of slavery collapse on itself. Brown’s attack originally went very well, they received virtually no resistance from the under-staffed Armory and they collected nearby hostages from farms with relative ease and informed local slaves about their impending liberation. Their first violent incident occured when Brown’s men told a baggage master to stop, the man, ironically was a free black, and he was shot after he tried to warn passengers of Brown and his men. News of Brown’s raid reached D.C. and Baltimore, by the morning, at the sametime Brown and his forces were already battling a local militia, made up of local farmers and townspeople, both sides received loses, but the town’s militia gained the upper-hand when they seized a bridge, that was blocking the only escape route. Brown and his men would move into the engine house, a small brick building at the entrance of the armory, the militia battered the building and Brown’s men shot back at them. Brown eventually sent his son Watson and another of his followers to go out and wave the white flag of surrender, but the militia was not yet ready to stop fighting and the two men were shot. The shooting would go throughout the day and another one of his sons would be shot, this time his son Oliver, who would soon die of his injuries. In the morning of October 18, Brown and his men were surrounded by a company of United States Marines, under the command of Colonel Robert E. Lee. The Marines broke into the engine room, using a sledgehammer to break down the door. When the attack was over, Brown’s men had killed four people and ten of his men were killed, including his two sons Oliver and Watson. Brown would be put on trial on the 27th of October, he was charged with murder, treason and conspiring with slaves to rebel. On the 2nd of November, he was convicted of all three charges. Brown was sentenced to hang a month later on December 2nd. 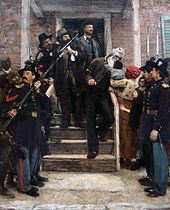 On the 2nd of December, Brown was escorted from the county jail, through thousands of soldiers, one of which was future Confederate general Stonewall Jackson and Wilkes Booth, who borrowed a uniform to gain entrance. 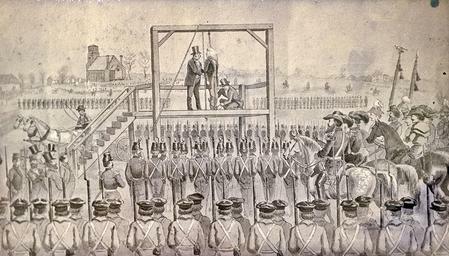 Brown was hanged at 11:15am and pronounced dead at 11:50am. Young women from a local public high school in Pretoria, South Africa take a stand against school authorities, who demand they “tame” their natural black hair. By straighten their hair to fit white or European standards. Decades after colonialism and the apartheid ended in South Africa , the perception of black inferiority still exists in the minds of many Black/African people.